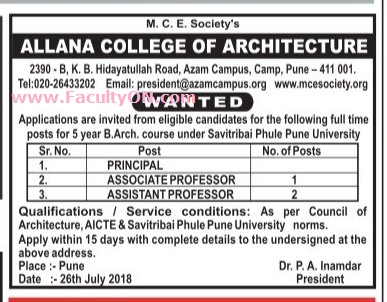 Allana College of Architecture, Pune has advertised in the LOKSATTA newspaper for the recruitment of Associate Professor / Assistant Professor / Principal jobs vacancies. Interested and eligible job aspirants are requested to apply within 15 days from 26th July 2018. Check out further more details below. About College: Architecture is one of the four professions recognized by the Education -Ministry in India along with Medicine, Law and Chartered Accountancy.It is not just designing; making layouts and getting them sanctioned from local authorities, but is an art of creating spaces: spaces that are built and unbuilt, spaces that create an environment appropriate for the required use. The role of the architect lies in not only planning for a specific activity in such a space but also to make the space interesting, inviting, imposing and comfortable. Creativity and visualization being the prime aspect of the architect, he also needs to have an updated knowledge of how to bring his imagination to physical existence on the earth. How to Apply: Interested and eligible candidates are requested to send their application in full details along with copies of certificates / mark sheets and recent PP size photos to the following postal address address.